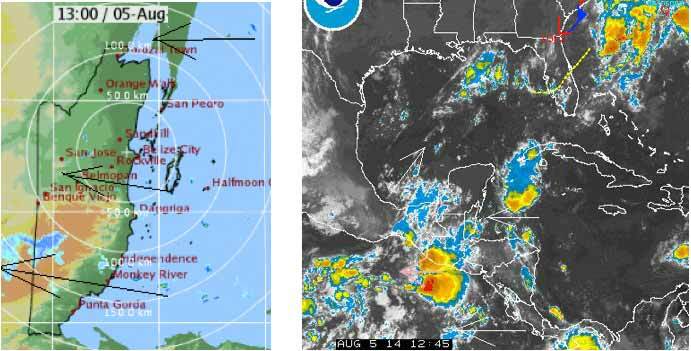 Belize NMS: Tropical wave over area will produce somewhat showery conditions today, moving away tonight. 24-hour forecast: Cloudy at times with a few showers or thunderstorms over most areas this morning, mainly inland and in the north this afternoon and evening, then mostly over the south tonight. Partly cloudy skies tonight with isolated showers or thunderstorms. Cloudy at times tomorrow with a few showers or thunderstorms over most areas. Today: Winds: East 5-15 kts. Seas: Choppy. Waves: 2-4 ft. A few showers and thunderstorms. Tomorrow: Winds: E-SE 10-20 kts. Seas: Choppy - moderate. Waves: 3-5 ft. Isolated showers or thunderstorms. Marine Outlook: Winds: E-SE 10-20 kts. Seas: Choppy - moderate. Waves: 3-5 ft. Isolated showers or thunderstorms. General Outlook: (Wed & Wed night) Sunny or partly cloudy with only isolated showers or thunderstorms developing. Tropical Weather Outlook: At 3:00am the center of Tropical Storm Bertha was located near 33.4°N latitude and 72.9°W longitude or about 475 miles West of Bermuda. Bertha was moving towards the NNE at 22 mph with maximum sustained winds of 65 mph. 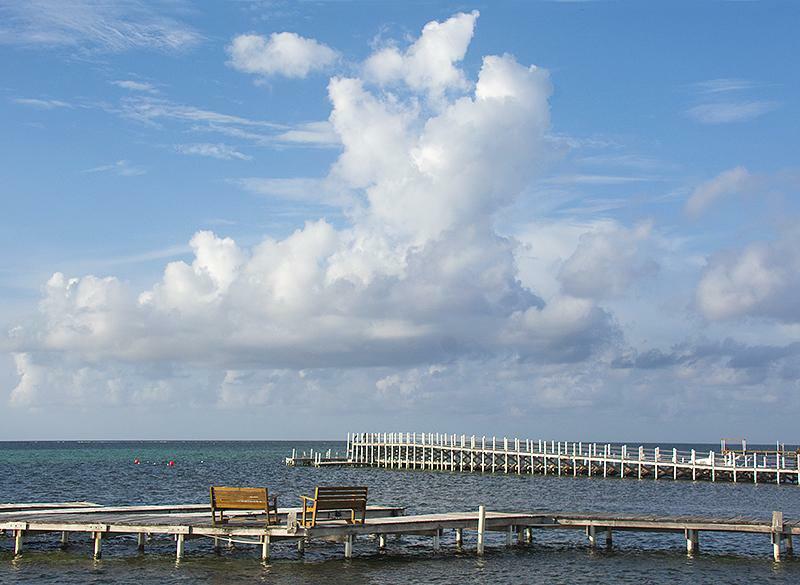 On Ambergris Caye this morning it's calm and clear with a breeze from the ESE at 7 mph and the expected high is 89. Large areas of rain in Toledo this morning, smaller shower areas further north. .. This has been caused by the bubble of wet weather that has moved up from the south. . .. .Including a small ITCZ activity over Toledo. . . .This is reducing now and perhaps the rain showers will also reduce in numbers and size later. . Mainly a cloudy day, but with some sun from time to time.. . . .Looks like the TS broke up last night.